Ten actual camping days of the summer left. 11 if you are a stickler, but that last day of camp doesn’t really count since the busses pull out and the last camper is gone by 9 a.m. on Saturday August 11. I can’t believe it! Time flies when you’re having *this much* fun! A view from the office porch. What a day on Plum! So what are the guys up to today? Well, after a breakfast of pancakes and a yogurt bar, they were out tearing up the fields and the waters enjoying the most amazing temperatures. Last night was cool, I found myself getting really snuggled under the covers around 4 a.m. (It was hard to drag myself out of bed at 5:30 for a run…ugh!) and this morning has just been lovely. They keep saying highs in the high 80s, but I’m just not seeing it. 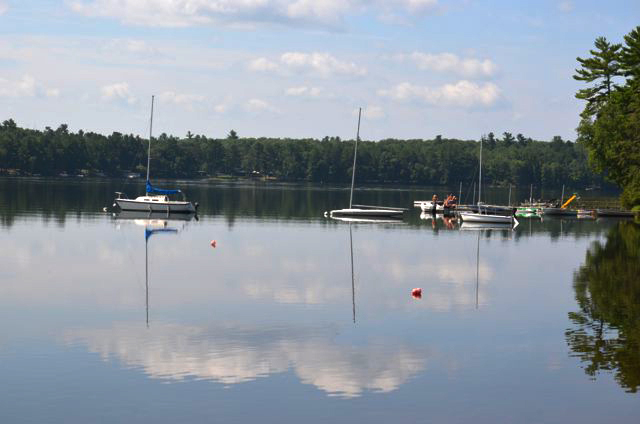 A calm, glassy lake is calling the skiers and wake boarders among us! Cabins11, 25, 10, 1 and 2 are all getting pulled behind a ski boat today. 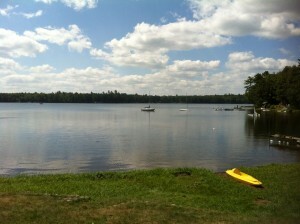 And wouldn’t you love to be in a canoe on this lake (right)? Cabins 12, 13, 15, 21, and 3-7 (remember lots of guys are on trips) are all going to be working on their J-strokes and rudders today. Cabins 25, 13, 24, 9 and 11 will be embracing their inner Katniss at Archery. Sailing the balmy waters of Plum today are cabins 1-4, 8, 12, 16 and 18 (believe it or not, there is a decent breeze). Cabins 23 and 8 are fishing, and 24, 9, 10, 25 and 17 are all chasing a ball around at soccer. And that doesn’t even count the guys at adventure, lacrosse, basketball, baseball, kayaking, riflery, skin diving or track! Man, I wish I was a camper. At lunch we’ll be dining on oven roasted pork, corn soufflé, mashed potatoes, tomato, onion and cucumber salad and cream puffs for dessert. Y.U.M. And if that isn’t delicious enough, the guys will have tater tot casserole (a camper favorite) for supper. P.S. I’m working on uploading the cabin photos. We are missing a few of the Senior cabins, but I might just go ahead and get up there what we have. As we ease into the home stretch of Camp, the guys are out enjoying activities, making the most of their free time and really solidifying friendships. These last two weeks of camp are bittersweet. But we really try and savor each moment from here on out. There’s an incredible wind coming up from the south, warm and lovely. Our oldest campers all go on a “big trip” at Highlands, and there are lots of guys coming in and out in the coming days. The first hiking trip to Pictured Rocks left yesterday, and the first of two sailing trips on Lake Superior and the canoe trip in the Boundary Waters of Minnesota leave today. Our tripping program has a long history at Highlands, in fact you can read more about it on the Camp Highlands Archives. Each division has a trip that’s geared toward the age group. The Cubs go on an overnight, the Colts have a three day canoe trip and the Juniors take a three or four day hiking trip. By the time a boy is a Senior, he gets to chose from several amazing trips we offer. This year we’ve introduced *another* awesome trip – kayaking on the Namekagon River in northwest Wisconsin. Jealous! There’s an easiness about the days right now. A good portion of the older guys are out of camp, so the little guys have extra opportunities at skiing, shooting at riflery, and more. They rule camp right now! Today’s menu doesn’t disappoint! Lasagna for lunch and soup and sandwiches for supper. Stay tuned in the coming days for a great interview with head chef Lois Craig who’s been keeping our bellies full for 24 summers. Now that is a legacy! Remember, camp is over on Saturday August 11 at 9:00 am. If you haven’t notified us of your plans for your son’s travel home, please let us know. If you have any questions about the Final Banquet, check out Andy’s information about the end of the term. As a mother of a not-so-sportsy kid, I enter each summer with a little trepidation. J is a great kid, of course, but he doesn’t long to toss the ball around the back yard at the end of the day. He rides his bike. Plays the piano. He’s a really good drawer. Here we are at Highlands, where the guys are out playing basketball and baseball and lacrosse. Soccer, football, tennis. Not his thing. We are now in *his* 7th week here at camp. Our summers are a little different than most campers. We get here two weeks before camp starts, and we stay after camp ends. It has the potential to get….long. I worry. Has the magic worn off? Yesterday he tracked me down. All smiles. “Mom, I dropped a ski. I couldn’t get my foot in the binding, but I was so close!” Seconds later, Ross walked by and said, “This kid! His hitting has improved SO much! He really worked hard on his swing AC and he was making great contact with the ball.” J was beaming. I got that prideful, swelley, prickly teary-eyed feeling. It wasn’t that I was so happy he’d hit the ball. It was seeing the look of accomplishment on his face. It was seeing this kid who can get down on himself for not being good at shooting hoops experience a true sense of pride. He has been working on that ski drop all summer. He’s been encouraged to keep plugging away at ACs in baseball. At summer camp at Highlands, the structures are in place for him to stick with things. He’s got a huge network of guys, both staff and campers, encouraging him to set goals, work hard and make progress. All that, and he has time. Real time to improve. Time that in our day-to-day in Gainesville – where we are rushing to this, rushing to that, making dinner, doing homework – just doesn’t exist. Maybe this summer isn’t too long. I’m going to slowly back away from my back-to-school shopping and I’m going to go sit in the boat and watch our campers have their successes, one Achievement Credit at a time. I’m going to watch these guys enjoy every last second of “camp time,” where they don’t rush, they make progress, they improve their skills, they have fun. I’m going to go watch them make small steps toward a better self. I’m going to go watch them be boys. A note from Director, Andy B. We are thrilled to have you as part of our Highlands family this summer! I trust you are keeping up with the goings on about camp through our pictures and blog, and I hope that your camper has written you to keep you updated. We try our best to get as many photos up on the site, and write as many posts as we can! The end of the term is quickly approaching and there are a few things we want to make you aware of. Our end-of-the-term festivities take place on Friday, August 10. At 3 p.m. we have an Army-Navy Water Carnival competition. This is always a goofy and fun way to catch a glimpse into camp life. At 6 pm we have a family picnic dinner followed by a fun evening program highlighting our summer together. We hope you can join us. Please email us the names of who will attend the picnic if you have not already RSVP’d to on your forms. We like to make name tags and we want to be sure to have enough cheesy potatoes to go around! At this point our Lodge cabins are all booked for the end of the season, but if you would like to come up for a visit while your boy is at camp, give Sharon a call at 715-542-2950 and she can help you out. We’d love to see you! Your boys are in great hands, with an outstanding staff whose first priority is to make sure you son is safe – physically and emotionally. Our next priority is to ensure your son has a great time at Highlands – all the while imparting the values of the Worthwhile Highlands man. Thank you so much for sharing your son with us. We are grateful that you believe that a summer spent at Highlands is a worthwhile investment. And if you’d really like to get into the Highlands spirit, consider joining us with your entire family for our Friends and Family Camp during the third week in August (the 11-18th). It’s a lot of fun for everyone! There is more information about it on the Friends+Family Camp page on the website. Check it out! And of course, as always, if you have any questions or concerns, don’t hesitate to give us a call here in the office at 715-542-3443. Every summer when I go over the Camper Expression forms (the forms all campers fill out before they get to camp, expressing what they hope to accomplish at camp this summer) I am not surprised that the number one hope for the vast majority of our campers is a very simple one – to make new friends. All of us want to make new friends. We want to find new and interesting people to hang out with. 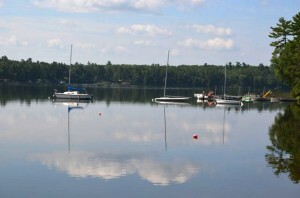 We want to find someone to play catch with, or to go sailing with, or to be our buddy at free swim. But making new friends, and being a good friend is not always that easy! So this past Sunday at Assembly we explored what it means to be a good friend, and how to improve our friend-making skills. Because Camp is a perfect place to do that. It’s a perfect place to make new friends, because there are friends-to-be all over the place! And they all want to make new friends too! Another reason it’s a good place to make new friends is because here at camp we try to live a little differently than how people might live at home. We try to live the “I’m Third” motto. Ross Freeland always does an excellent job sharing the “I’m Third” story, and how our simple philosophy of putting God (however God is known to you) and your values first, putting other people second and yourself third is a great way to live. Ross spoke of how “I’m Third” is the heart of the Highlands experience; it is the muscle that provides the life blood to all that we do at camp. And if “I’m Third” is the heart of camp, then the Honor Camper Qualities are the backbone! Also at Assembly this week, we took a closer look at some of those qualities with real life examples from home and from camp. Charlie Stearns spoke of the importance of consideration, especially when we live in such close cabin environments. John Milner talked about initiative, and how great it is when the older guys invite the younger campers to go sailing or to do something fun. Kirien Katzmarek spoke of how willingness and helpfulness make life at camp a little easier for everyone. Johnny Zokovitch shared how at camp it is important that we try to be generous, not just with the cool things we bring to camp, but with our time as well. Nick Morgan shared how people with Camp Spirit live the Highlands motto in their daily lives, and Antonio Carrera shared how a dependable person is someone that you can count on, in good times and in bad. We then had “The Highlands Players” act out a few scenes for us of negative and positive ways we might react to some common camp situations. We saw what happens when a waiter drops his tray in the dining hall (here at Highlands nobody makes any mean comments or applauds mistakes, instead a flock of people swoop in to help clean up). We saw how guys might react if a cabin mate can’t catch a baseball, or what to do if someone feeling homesick. Finally, they showed us how easy it is to find a friend; with Davis Altorfer meeting Trey Taylor, then introducing him all around to Reed Altorfer, Kent Taylor and David Swarts. At the end of assembly I challenged the guys to do three things this week. One. Smile. It’s amazing how friendly a place gets when people simply smile at each other. Two. Offer three compliments to other guys every day. And finally, invite someone that you don’t know very well to go and do something. I was really encouraged to see that not long after Assembly, Pablo Vilarreal invited Judah Bachmann to go play teather ball, and just yesterday afternoon, Hayden Bingham took Clayton Stewart out for a sail. Our hope here at Highlands is that the guys will see that with just a little initiative and a little kindness, the world can be a better place. I get to see that every day here at camp. I’d say that sums it up. A day at Highlands is *pretty awesome* almost all the time. And on a gorgeous morning like this morning, it’s impossible to have a bad schedule. Throw an evening dip and skiing at free-time in there and I’d say you have perfection. Wow! What a lake! Makes me want to go water skiing! Check out this photo of the lake from this morning. Pure glass! Lucky cabins 23, 24, 17, 2, 8 and 10 will all kayak at some point today. Cabins 16, 3, 4 and 22 will hit some balls on the tennis courts. A group of six Seniors even went across the lake to play a round of golf at the beautiful Plum Lake Golf Course. And that’s just the tip of the iceberg! We’ve been extra busy in the camp office tying up all the loose ends from first term, so if we haven’t posted a photo of your favorite camper, stand by! We’ll be out taking more photos in the next couple days. Mike does a great job of getting all those faces eventually. This upcoming weekend is the Camp Highlands birthday. It’s my favorite day all summer. The main event is the Army versus Navy Steeplechase, a two-hour, rip-roaring relay race all around camp. Each boy participates in a pre-assigned activity, cued by the baton being passed from runner to runner. Activities range from jumping into a hula-hoop from Tower Three, to canoeing all the way from Senior Row to the Star Lake portage, to a water boil (the peak of the excitement!). In the afternoon boys will look forward to the Senior Carnival, picnic supper and our world-famous Games on the Hill. To me, that spells hundreds of photo ops! If you are in the area, we’d love to see you. The Steeplechase starts at 9:15 a.m. and goes until 11:30 a.m. or so. The Carnival is at 2:30 p.m. and supper is at 6 p.m. You’ll believe it then, when I tell you that we are already deep in preparations for this weekend! P.S. Our Program Director just walked into the office and said, “Today is perfect. The temperature is perfect. Have you seen the lake? It’s glass.” And, if you know Craig, you’ll know he is not a man prone to hyperbole. It really is pretty sweet today. For the staff here at Highlands, the last 5-7 days have been BUSY. The end-of-term festivities and the full business of starting a second term is no small task. But here we are, Thursday of week one of second term, and I think I just heard a collective sigh of relief. Campers are getting settled into their cabins, forging new friendships. This is about the time when campers really start to feel comfortable, since they finally know what’s coming next. The bugle calls start to sound familiar (waiters, waiters come and get your pork and beans) and they look forward to what games they’ll play in the evening. Yesterday was Division Day, otherwise known as cook’s night off! The guys band together as divisions and have activities and enjoy their counselor’s cooking of hot dogs and other picnic style food. We had an extra special treat yesterday when the older girls from Red Pine Camp came over for a social. It’s about what you’d imagine – games, punch, hot dogs, a “dance.” Awesome camp stuff. I can’t wait to count the letters that go out to RPC in the next few days. Our boys were perfect gentleman while hosting a great Highlands evening. The weekend is coming up, and for me, it feels like the first weekend all year where we aren’t in the thick of something. Saturday will be an event day of some sort, to be determined. Check out the photos of Avatar day from last term to get an idea of what I’m talking about. Of course Sunday will bring Assembly and Sing! Come on up and visit if you can, the weather is AMAZING. Oh, and have I mentioned our Pinewood Derby in effect? Maybe your camper wrote home about it? Jim Di Domenico and his wife Becky (who’s partnered up with Chris Dahlman in the craft shop) have headed up this AMAZING activity. We have an 80 foot track calling those pine wood cars names! Keep checking the gallery for photos. We usually post on Facebook when there’s a fresh batch up. The bugles have called, the water for the spaghetti is boiling and the buses have rumbled in, and all of camp has turned out onto the track to welcome in Second Term 2012! It’s an awesome scene. Boys who haven’t seen each other in a year slap hi-fives and bear hug. Forever the mother, I worry about how the new boys will know what to do. How will they find their counselors? Who will carry their gear to their cabin (those trunks are heavy)!? It’s one of the many lessons I’ve learned as a serious female minority at boy’s camp. Leave them alone. This doesn’t need to be micro-managed (my specialty). They’ve got this. Moooooommmmmm. Within minutes everyone’s gear was unloaded and hauled off to their cabins and the boys are on their way to being fast friends. There’s really no other way. The boys who haven’t been here before are eager to make some friends, find someone who can tell them what the heck is going on. And the boys who have been here before are excited to make new friends and lend a hand. After dinner tonight, the guys will have campfires where they learn the in’s and out’s of Camp – baseline rules about how things work and what they can expect in the next few days. Tomorrow they’ll have more in-depth safety talks and get the inside scoop on the dining room and how to be the table waiter when it’s their turn. By 10:30 tomorrow morning they’ll be fully immersed in earning Achievement Credits (ACs) in their activities. We are so glad they are here! It’s that scene in the movie. The flag waving over the boat house is blowing northward. There’s a pause in the breeze, the flag comes to a rest. And then the wind switches and the flag sputters up again, this time to the south. A change in the air. A new direction. As this first term comes to a close, I can’t help but think about what will happen to these fierce boys who’ve often been plucked out of their nice, cozy nests and plopped right down in the middle of nowhere without screens on the windows or electric in the cabins. No doubt they’ll be logged into their Facebook accounts, watching a DVD and texting with a vengance before they even hit Highway 51 on their way home. There will be moments in the next few days and weeks when they will stop in their tracks and be transported to Highlands. It might be a cool evening storm that brings on the memories. It might be as they lay in bed and try to conjure the magical call of the loon on a moon-mirrored Plum Lake. It might be when they are helping mom and dad with dishes and laughing just like during cabin chores each morning. I wish I could bottle those moments. I’d make them into a snow globe so I could shake that magic up on demand. I just snuck out of the final banquet early to work on tying up loose ends for second term, and I had a catch in my throat. It could have been exhaustion, or the fact I have been talking for three days straight. But the truth is, the wind HAD shifted direction and intensity during the evening. There WAS a change in the air. Utter quiet, save for the bursts of applause coming from the orange-lit dining room windows, combined to create a special calm in camp and in my heart. A bit of a snow globe moment of my own. I’m overwhelmed with the bravery of the four boys who stood in front of a crowd of hundreds of people and confessed their love for Camp Highlands. First time Cubbie, Erik Anderson, who talked about all the amazing activities at camp. Colt, Christopher Russell, who was nearly swept up in emotion talking about overcoming his homesickness and his new Highlands family. Junior, Ian Pratt (great-great-great grandson of Doc Monilaw) who wrote his speech on the back of a riflery target. Senior, Diego Casas, second generation camper, who recounted his memories of the many summers he’s spent here at Camp starting with Kent Overby as his counselor, “The Best.” He spoke of the feeling he had when finding his father’s name written on his bunk. He said, “What I definitely won’t forget is what camp teaches us every day, to be Worthwhile Men….I am proud to be a Highlands Man.” I agree. I’m sure I missed lots of good silliness during Tin Awards, and I know I missed moments of parental proudness for Honor Camper awards. But I think hearing about Camp in the words of those bold young men was the perfect way for me to usher out First Term. I can’t wait for these guys to be struck with moments of pride in themselves for their accomplishments small and large. I can’t wait for them to live out the “I’m Third” philosophy in their everyday lives. I can’t wait for them to be more in tune with the natural world around them. I can’t wait for them to have that snow globe moment – slow motion, sweet and perfect. But mostly, I can’t wait for them to come back next summer. Even though it represents the end of a camper’s summer at camp, the Kerchief Ceremonies are my favorite gatherings of the summer. 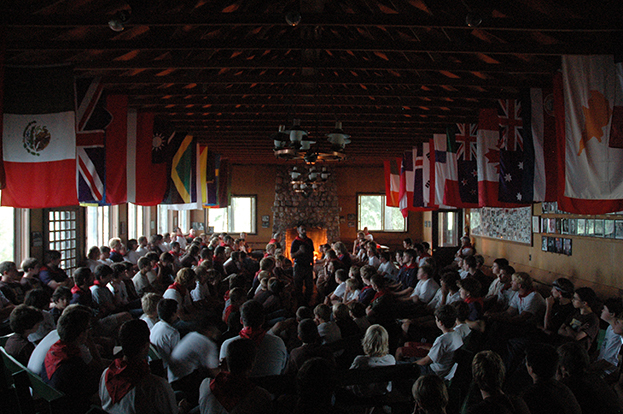 I have fond memories of this ceremony during my time as a camper; darkness interrupted by a crackling fire, the smell of the smoke, Mike and Snow sharing friendly, thought provoking, words which prompt all campers to consider the less obvious but most important aspects of their summer. It was exciting to see the record of my achievements even though my accomplishments were not as numerous as those of many of my friends. The emphasis of the ceremony is one of recognizing accomplishments of all kinds and all campers share a sense of pride in recognizing how much they have grown in countless ways during the course of a camping session. There is a comforting sameness to this tradition that connects you to the Highlands family. You feel a sense of satisfaction in knowing that your friends, counselors and in many cases fathers and grandfathers have once sat in the same place and had this same experience. While many accomplishments are connected to activities, the bigger achievements are related to areas of personal growth such as gaining greater independence, overcoming fears and being considerate of others. I have been blessed with the chance to see all three of my sons’ progress from cabin 26 Cubs to staff members. Each time I saw my sons place their sticks on the fire of friendship I felt a great sense of pride at their growth. I feel a deep sense of gratitude for the many camping seasons that I have had the opportunity to enjoy at Highlands. Campers of today will have similar memories to mine; darkness interrupted by a crackling fire, the smell of the smoke, Andy and Craig sharing friendly, thought provoking words… The tradition lives on!